Looking for the best way to take your beach game up a notch? 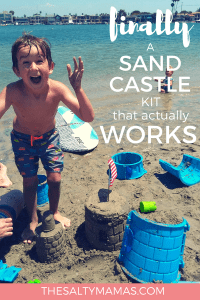 If your kids get frustrated by their attempts at building a sandcastle, you’re going to want to check out this Create a Castle review. Does Create a Castle really work? Read on to see! There are a few quintessential truths about summer. There will be lots of sticky kids covered in popsicle juice. We will eat our weight in watermelon. And we will spend loads of time at the beach. Having sworn to never take for granted how close we live to the ocean, we often load the car up with all the kids, chairs, snacks, and toys our SUV can hold for a day at the bay. My kids each have their own favorite beach activities. Izzie loves to stand at the waters edge and jump and splash – before making a mad dash into the water to try to prove that she can swim. Evie is content to lay on her towel, surrounded by snacks enjoying the sun. And Cole? Cole begins each trip to the beach with his never-ending quest to finally build the perfect sandcastle. 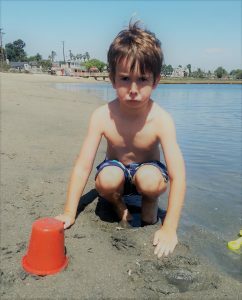 Tragically, no matter how many buckets and shovels and sifters we take to the beach, there will be waves of disappointment when my son just. can’t. get it. right. Try as he, and we, might, we just have not figured out how to build the perfect sandcastle. Which is why we maybe freaked out with excitement when we found Create A Castle. What is Create a Castle? Founder Kevin Lane was as frustrated as Cole with the traditional bucket and pail method of building a sandcastle. He decided to figure out a way to make it easier, more successful, and most importantly to us, more kid-friendly. And did he ever! Here’s our Create a Castle Review of the Pro Tower Kit. A big thank you to Create a Castle for sponsoring this post – and introducing us to this amazing product! Create a Castle reached out to us to review this product, and provided us with a sample. As always, the thoughts, experiences, and opinions expressed here are our own. We got our sandcastle kit on a Friday and immediately rearranged our weekend to get us to the bay on Saturday. 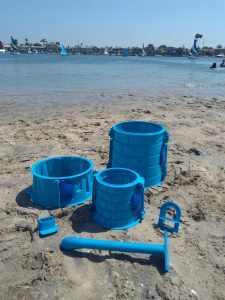 We threw all of our beach gear, including our new Create a Castle kit (which comes in it’s own mesh bag AND the pieces come apart so it doesn’t take up a TON of space like a regular sand pail) into the car and went. As soon as we got to the beach, we busted out the bag and began assembling the buckles to the sculpting pieces. And if you have an impatient five year old like me? Have no fear, it only took a minute or two to assemble the buckles! Don’t Skip This VITAL Step! So, does the Create a Castle kit really work? Well, it depends on what you’re expecting. Being the overachiever that I am, I took a look at the complicated three tiered sandcastle shown on the flier that came with the kit and decided to start with that. My first pro tip for you: DO NOT START WITH THAT. In fact, don’t start with heading straight to the beach. The very first thing you should do is check out the awesome tutorials provided on the Create a Castle YouTube page. My husband makes rockets for a living that go into space, so trying to get him to follow instructions for anything is a challenge. Telling him he might not be qualified to build a sandcastle is near impossible. But sure enough, our first try at seeing if the Create a Castle kit worked was a bit of a failure. Did we have the sand wet enough? Too wet? How do you stack these things anyway? 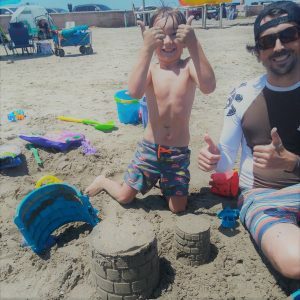 While my husband fumbled away with a trial and error strategy, I hunkered down in my beach chair and watched this video, which literally answered every question I wondered the first time I built a sandcastle. So if you like showing off to your husband that doesn’t follow instructions, subscribe to the Create a Castle YouTube channel so you can say “I told you so.” It is incredibly satisfying. And so is building an awesome sand castle. Full disclosure for our Create a Castle review: We never got to make the awesome three tiered sand castle. Remember that impatient 5 year old I mentioned? Well, by the time I had done my research on how to make the perfect castle, he was ready to get his own hands dirty and take over the job. I admit, I was a little nervous to hand over the reins because I didn’t want him to be disappointed. Again. But he wanted to try, so I left him with his Dad to work on it while I chased his sisters for a while. When I came back, I was excited – and relieved – to see nothing but smiles! None of the usual tears and frustration I’d become accustomed to! And the castles looked really cool. The brick detail made it look “just like a real castle!,” my son would exclaim. And he LOVED the window cutter tool, which he carefully and dutifully used to add LOTS of windows. But Does the Create a Castle Kit Work For Kids Who Want to Make it On Their Own? This was the real test. Cole wanted to make one completely on his own. Again, I braced myself for disappointment. I was unsure if he could fill the structure with the right kind of sand, or open the buckles on his own, or pull the sides away gently (not usually his strong suit). I might have held my breath the entire time he was building his castle. He was focused and worked hard to make the perfect sandcastle. 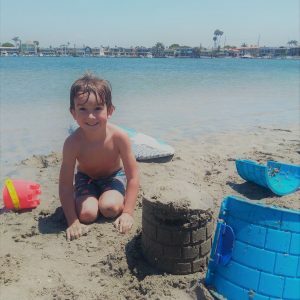 While it might have crumbled a bit at the top, it was still the BEST sand castle this five year old had ever even dreamed of making. And really? That’s all I want – for my kid to feel like it’s a masterpiece – which is something he had never felt with the old bucket method. As someone that hauls a LOT of stuff to the beach, space can be an issue for us. But because of the removable buckles, everything packs down so much smaller than other sand castle kits. My husband (who is in charge of cleaning all the sand toys before we leave) loved how easy they were to clean once taken apart. The buckles also make the pieces super versatile because you can interchange any of the sizes for maximum creativity. Plus, everything is compatible so the buckles will continue to work with any future product releases to build even bigger castles! If you are looking for awesome ideas at how to create amazing castles, you’ll definitely want to follow Create a Castle on Instagram. Build a city with @createacastle ?. Order your very own from createacastle.com! Not Just for the Beach! Okay, I couldn’t leave this one out of our Create a Castle kit review. While it is no secret that I’m a SoCal girl at heart and have never enjoyed being cold, we are absolutely going to the mountains this year. Because you can use this kit to build SNOW CASTLES. My daughter will freak out when I build her Elsa’s ice castle people. And better yet, what used to be a “summer activity” is getting new life during the winter. 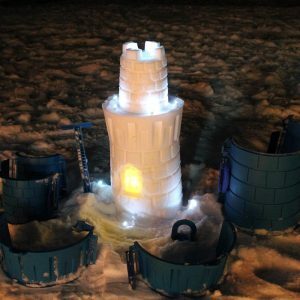 I cannot wait to try it and make one of these amazing castles. Where Do You Buy a Create a Castle Kit? Now it’s time to stop being jealous and start making some castles! Make sure to check out all of the kits available from Create a Castle on their products page. We are loving the Pro Tower Kit – partly because we can make the elusive three tier tower, but mostly because all three kids can be making one at the same time! And when you do snag one, don’t forget to share the pictures of your creations with #createacastle and tag us too! We’d love to see what you and your little ones create! So does the Create a Castle kit really work? We’re happy to say that it really, truly does. With a little prep (don’t forget those videos!) we’re certain your own Create a Castle review will be just as beaming as ours was. And happy kids are about as good a review as anyone can get. Don’t forget to snag your own Create a Castle Kit here. Your kids will be SO glad you did.